Extra: Etherton’s Pop-Up Gallery is showing collages by Andy Burgess. Free Event: At 6 p.m., Friday, April 27, the gallery hosts “Speed Dating with Your Favorite Artists.” Jim Waid, Craig Cully and Andy Burgess will each talk about their work for 20 minutes and take questions. Waid and Burgess will do book signings after the conversations. Light refreshments. In the springtime a YOUNG man's fancy might turn to love, as Tennyson wrote, but galleries more often turn to nature. Etherton Gallery last spring exhibited brilliantly colored birds and blossoms painted by Gail Marcus-Orlen, works that exulted in the pure splendors of nature. This time around, the gallery has put together something rather darker: In Their Nature, a show of three artists who approach the great outdoors in wildly different ways. Robert D. Cocke and Craig Cully's psychologically fraught paintings use nature to ponder complex human failings. Cully paints large canvases of foxhunts but the green landscapes his hunters and their hunted inhabit are nothing like the tidy pastorals of Downton Abbey. Instead, they're disruptive and disorienting and sometimes violent. Robert D. Cocke's fantastical paintings feature sweeping dream landscapes marred by smoggy cities in the distance, and weird crinkum-crankum machines and half-remembered baby boomer toys, from tepees to tops. Jim Waid is the only one of the three who unabashedly sings the glories of unspoiled nature. A beloved Tucson painter of abstracted desert landscapes, Waid normally paints lush acrylics on canvas. This time around he has made 15 beguiling pastels on paper, and just one large painting. Waid's deserts vibrates with life and color. He zeroes in close to the ground—he almost never pictures the sky—and paints bugs and dirt and birds and flowers in heightened tones of red, amber and green. "Lilt" is full of movement; lines cascade diagonally across the ocher and orange ground, and tiny creatures—birds perhaps—writhe and dance on top. "Sanctuary" is black and red and white all over, a pattern painting with black squiggles wriggling over a saturated red. Green tendrils curve; yellow and blue petals pop; white wisps drift to the ground. Sometimes Waid aims for a paler palette. "Desert Fracture" is almost white, a desert bleached of color by the blazing sun, with black lines cavorting across the surface. And he takes a rare long view here, painting a distant hillside, where tiny saguaros erupt from the rocks. Waid writes in an artist's statement that he has been "seduced by the immediacy" of pastels. Pastels are like paint in the richness and infinite range of their color, but there's no waiting for them to dry to gauge how the work will look. With pastels, you get what you see, right away. Many of these fresh works are plein air pieces, created in Waid's "outdoor studio" in the mountains of southern New Mexico and some green piney works have nudged their way into his desert oeuvre. In the "Cloudcroft" series, crafted in the pines last summer, the vegetation is denser and the colors are cooler. In Cocke's paintings, the sweeping landscapes become vast stages for his lamentations about pollution as well as the technology that isolates us from nature. His intention, he writes, is to remind people of the "bigger, deeper and more awesome world out there beyond the urban, technological world that most of us inhabit." Cocke, who got his undergrad art degree at the UA and his MFA at the University of Iowa, contributed six large oils on canvas to the show, along with 15 small pieces. In "Modern Times," Cocke paints a sickly miasma wafting up from a distant city, and filtering into a sky painted an uneasy yellow and pink. Front and center, though, is an odd machine, a fantasy construction of wooden toys and cranks and hammer. Standing in for modern tech, this fascinating contraption distracts not only from the problematic air overhead but also from the abandoned prairie below. "Beginning," 2015, argues for the simple life. Taking its title from the book of Genesis, the painting is a close-up facial portrait of a contemporary Eve and Adam. Behind them in the Garden of Eden are sinewy apple trees ripe with apples; one juicy specimen is on the ground. Hard as I looked, I could find no snake. This is an Eden with no serpent to introduce trouble and pain, or to force Adam and Eve from their pristine promised land. Painter Cully, a Philadelphia native who studied at Temple's Tyler School of Art as well as the UA, was influenced by the region's long tradition of realist painting. But his representational paintings of the lush Pennsylvania countryside are nothing like those of Andrew Wyeth. Inspired by a brother who cheerfully runs a foxhunt in central Pennsylvania, Cully deploys the landscape as the setting for an examination of the uneasy relationship of humans not just to animals but to the land itself. Cully exhibits six large oils on canvas in his foxhunt series, Discourse of the Chase. The works paint a nightmare vision of the sport. 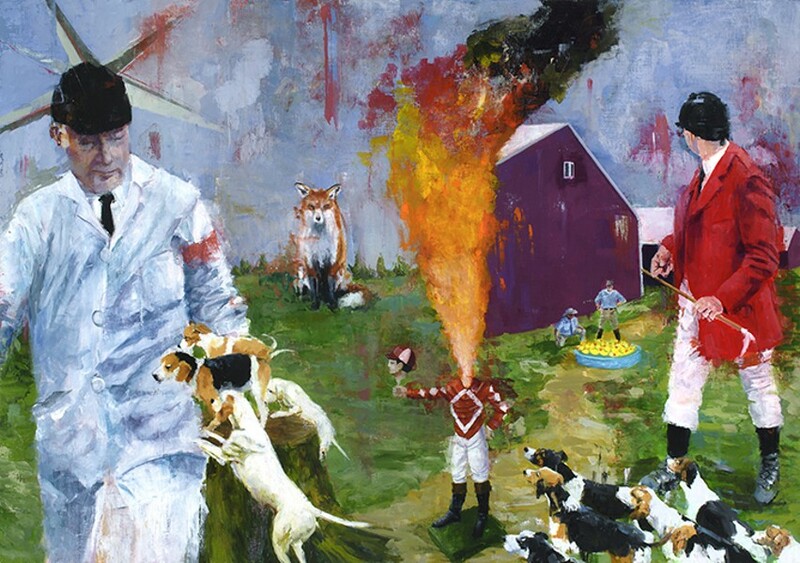 The hunters' coats are screaming red, so bright they hurt the eyes; little children frolicking in the fields could be crushed by the horses; a coyote howls; a jockey is on fire. In "Attention of Rivalry," those jockey flames spew into the sky and the clouds are stained blood-red. Everything is a-kilter and out of proportion. In "Attention," a fox is as big as a house. In "Teller of Tales," a miniature hunt is taking place beneath a fishmonger's table. Some portraits of the hunters, particularly of an old man who appears in several paintings, are affectionate, with a bit of compassion for people who know that the foxhunt tradition they love is dying. But these riveting paintings are mostly harsh. In the Easter-themed "Hunting the Resurrection," riders have exchanged their red coats for Easter lavender and children are searching for Easter eggs among the plants. But those sweet kids, bending in the field like Millet's "Gleaners," risk being killed by the horses. And a scary preacher in black rises up ominously in front, staring out at the viewer through creepy dark glasses. He seems like a specter of death. Cully does turn away from this maelstrom once in a while to paint beautiful small works of nothing but clouds against a blue sky. "Cloud Study #5" is particularly radiant, lit by the pale orange of sunrise. No red coats, no foxes, no fires here, just celestial beauty.